In a large bowl, combine white wine, water and yeast and whisk until yeast dissolves. Add honey, salt, olive oil and stir to combine. Add in flour and work with fingers or a spoon until the dough comes together. Pour dough onto a lightly floured countertop and knead about 2 minutes, or until smooth and elastic. Add the extra tbsp or two of water if the dough seems really, really dry (but try to avoid it). Pour kneaded dough into a lightly greased medium bowl, cover and let rise until doubled, about 1-2 hours. Pour risen dough on a pizza stone or parchment paper-lined baking sheet and spread out with fingers into desired shape. Use a rolling pin to roll out the dough until it’s as thin as you like. Top the dough with 1/2 cup tomato sauce, some oregano, basil and mozzarella cheese (or whatever toppings you desire) and bake for about 10 minutes or until lightly brown. Serve immediately. Pizza is a dinner staple at our house. At least once a week, we make pizza in some form – either on bagels, slices of bread, in pizza roll form or on a homemade crust. As you can imagine, eating all that pizza – even in multiple forms – got a little boring. That’s when I decided to take matters into my own hands – literally. Instead of coming up with new ingredients to top our pizzas (which is always a good idea), I decided to update the pizza crust standby we’d been using for years. When I made our first pizza with this White Wine & Honey Pizza Dough from Smitten Kitchen, it was as if the cloud of all those boring pizza nights was lifted! 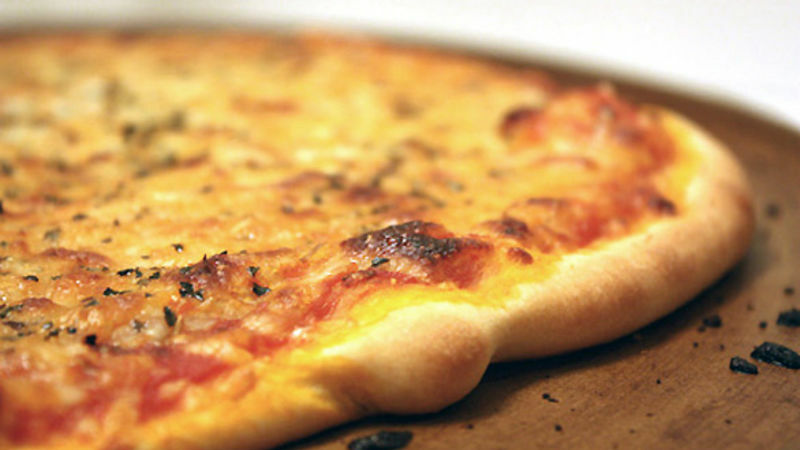 Despite the fanciful name of this thin-crust dough, it’s really quite easy to make. And what’s more, it holds its own when it comes to flavor. The honey gives it a hint of sweetness, while the white wine shines through with its floral, citrusy flavor. You’ll not only crave the pizza toppings, but the entire pizza! This dough, while rolled out thin, is soft and smooth when baked – unlike those crispy, crunchy thin-crust pizzas. So if soft crusts are not your bag, I wouldn’t recommend this dough. However, if you’re looking for a new take on your favorite thin crust pizza, this is a great place to start. This White Wine & Honey Pizza Crust has shed a whole new light on our weekly pizza nights, and it proves that when it comes to flavor, pizza crust doesn’t always have to get the shaft.